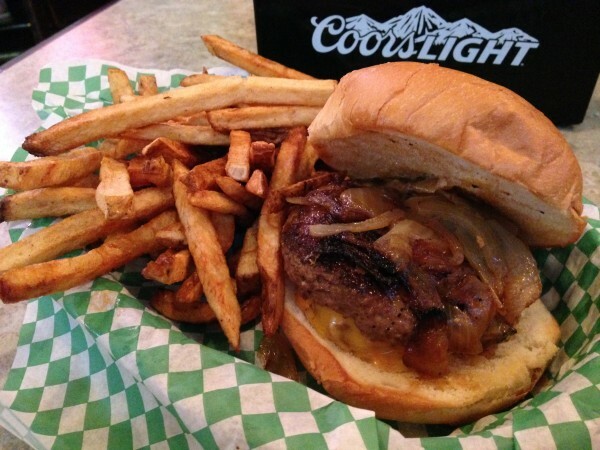 The Nook (MSP) – What Happened to the Burgers? It has been several years since my last visit to The Nook, in fact prior to the fire of 2010. 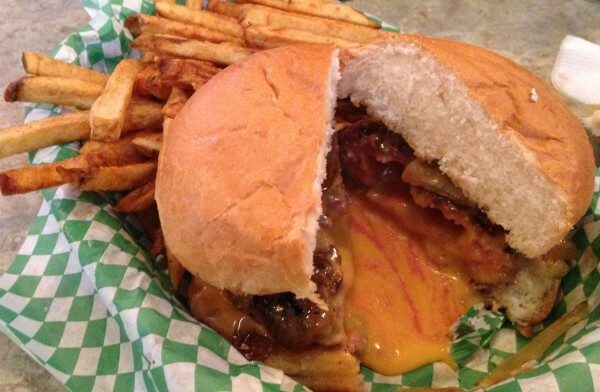 But the Juicy that I enjoyed prior to the catastrophe was one of MSP’s best burgers, so I was excited when my navigation system told me I was but a few miles away after a late afternoon meeting. The interior is reflective of the former configuration with a notable exception, the previously small kitchen near the front of the restaurant is now located in the rear with and open pass-through that allows the cooks to oversee the dining area. 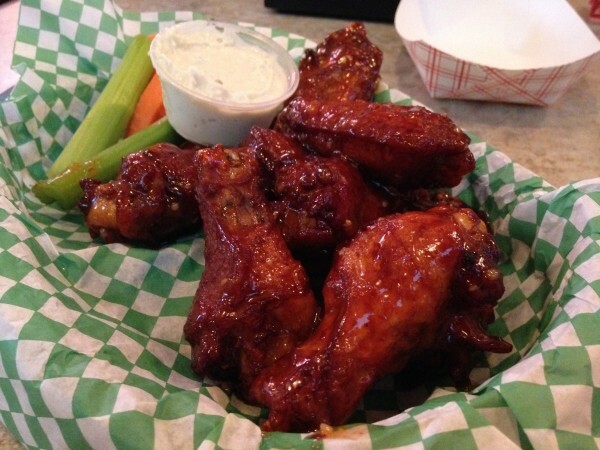 I was also in the mood for some wings and The Nook has also received raves about theirs. They offer nine different sauces and the menu guides the guests to the level of heat. I chose a conservative approach and ordered the “Honey Stinger,” rated #3 on their 1-9 scale. Eight wing sections make up an order. The wings were perfectly cooked, crispy on the exterior while still moist on the inside. The sauce was more sweet than spicy so if you are looking for heat, move up the scale. It did leave a mild tingle to the lips. I would probably try #5 next time. True to tradition, I ordered the Juicy Nookie Burger with fried onions and a basket of fries. When it arrived it looked delicious, but as I would learn over the next few minutes, looks can be deceiving. I grabbed a few fries. They were limp, cool and without any salt. This was not a good start. I cut the Juicy in half and the cheese gushed out from the middle, not an ooze, but an enormous gush. What was left was a thin shell of meat plus an enormous chasm. It was more cheese than meat. My first bite was incredibly disappointing. The once flavorful meat was flavorless, no seasoning at all. What happened to one of my favorite burgers? And the bun was even worse, crumbly, and flavorless; it did not even meet the low standards of bagged supermarket buns. This may be sacrilege, but this burger and fries were some of the worst I have ever eaten. What used to be one of my favorites is now on the DNR list. After two bites of the burger and a handful of fries, I pushed to the corner of the table, not worth the calories. Needless to say that even with a pretty good set of wings, The Nook is a Juicy destination, and after this last experience, it will be a hard call to return. Located two miles east of 35W on East Lake, Sonora Grill was recently received accolades from several local publications, so I decided to give their tacos a go. With ample parking, both on the side and behind, plus on the side street it was an easy stop. The restaurant offers seating both inside and outside under its pergola. The menu is broken into several sections, but I was there for a taco sampling so I ordered four, the pork, chicken, tongue and skirt steak. The menu described minor modification to the accompaniments to each of the meats, ranging from Chipotle salsa, to cabbage, to onions, plus a few with cheese. When they arrived the first noticeable trait was the amount of filling; Sonora Grill serves as much filling as any taco I have ever eaten. It challenges the guest to carefully wrap, lift and bite without losing any of the filling. The second, very positive item, was the onions, not raw or flash grilled onions, but beautifully caramelized, which was a fantastic addition. The best of the four tacos was the “Tongue.” The menu mentioned it included Chipotle salsa, cilantro, onions and cabbage. I saw no salsa. When I asked the server, he mentioned that the salsa was mixed into the meat. Whether this was true or not, this combination was outstanding. It delivered great flavor and texture from the meat, which was soft and delightful. The cabbage added just a touch of crunch and the thinly sliced jalapeño pepper slices kicked the spice level without overwhelming the other flavors. The other taco that was delicious was the “Pork Guajillo” served with melted Chihuahua cheese, onion and chipotle salsa. 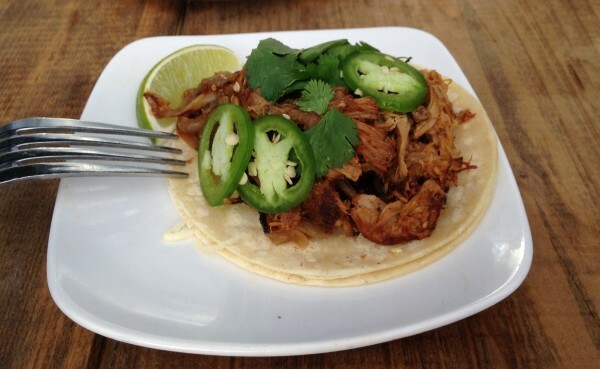 The pork was slowly braised to create a subtle texture, and in combination with the sweet caramelized onions and jalapeños create a great balance. Again I was told that the chipotle salsa was mixed into the meat. 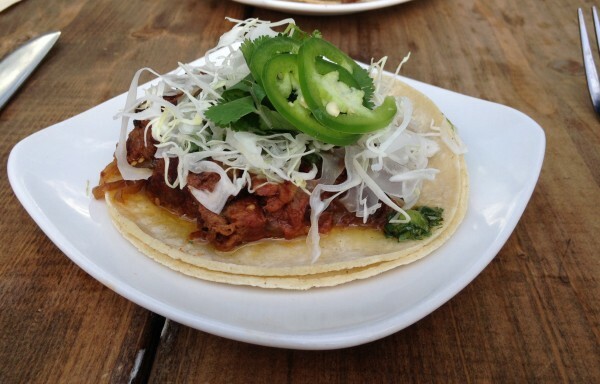 I really liked the addition of the caramelized onions that added an unusual sweet component to the tacos. Unfortunately the other two were not as good as these two. The “Chicken Rioja” was served with Chihuahua cheese, Arbol aioli, and orange salsa. 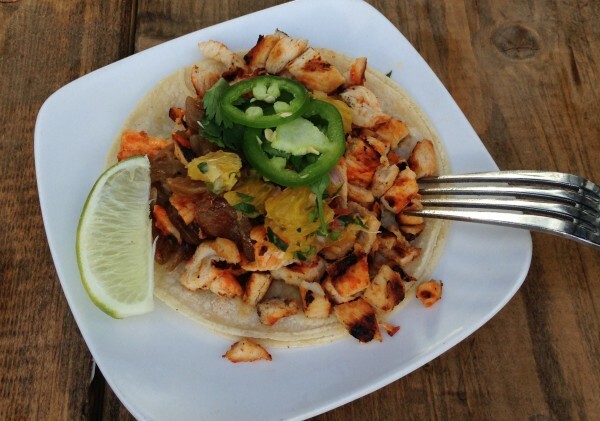 The chicken was first spiced with smoky seasoning and then cut into small dices before joining orange segments, thinly sliced jalapeño peppers, caramelized onions and some cilantro. The chicken was dried out, chewy and the seasoning overwhelmed the flavor. The aioli added a great creaminess (which was really required) and the oranges brightened and balanced the dish. The “Beef Skirt Steak” was the polar opposite of the tongue, so much so that I left more than half on the plate. The menu stated it was accompanied with Chihuahua cheese, onions and chipotle salsa. 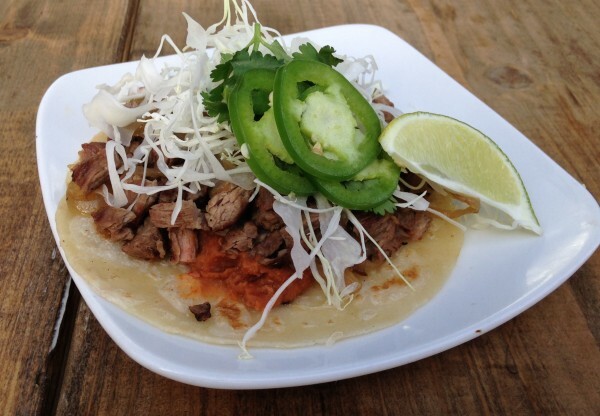 Mine was also prepared with shredded cabbage, sliced jalapeños and re-fried beans. The meat was so vastly overcooked that it was impossible to chew. There was no opportunity to include the salsa in the meat and once again it was missing. The addition of the beans was an attempt to save this combination but it failed. This should never have left the kitchen. Overall I liked two of the four tacos but the other two were badly executed. The amount of filling was substantial but I question whether the server was completely honest when he told me the chipotle salsa was mixed into the meat. Located at the entrance to downtown SONO on North Main St., Kazu offers a variety of Asian cuisine. Whether you are looking for creative sushi rolls, combination platters or a quick Bento Box lunch, Kazu has numerous choices. With tables that seat over 50 guests and a long sushi bar along the rear wall, there is plenty of seating. 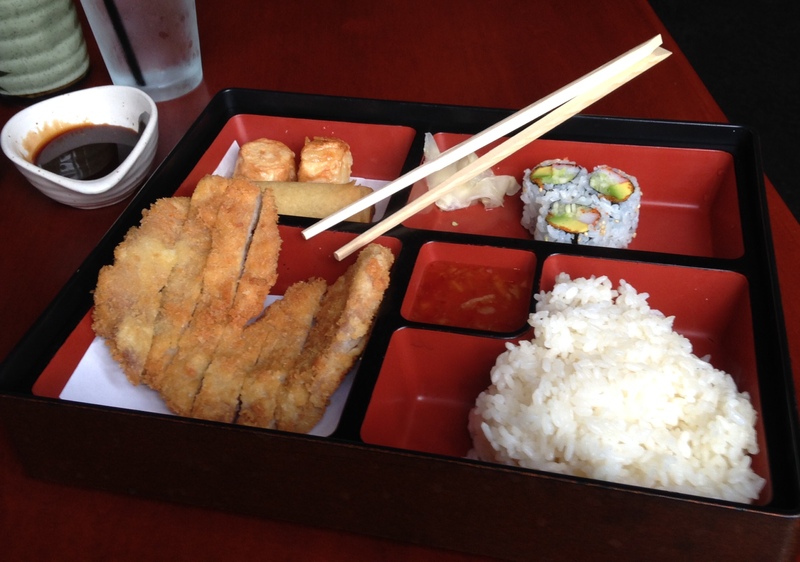 I really liked the Pork Katsu Bento Box on my recent visit. It included two small dim sum, a mini-spring roll, three pieces of a California Roll, a mound of rice and a pork cutlet, a several course meal for $11. The first taste was the California Roll, it delivered fresh flavors and was a good start. Moving to the dim sum, I really liked these small niblet; filled with a delicious pork mixture. The spring roll added a little crunch and then I moved onto the Katsu. The pork patty was breaded with Panko, nicely fried, crispy on the exterior and just a touch of toughness to the meat. Dip in the hoisin sauce and it was a delightful, quick meal. As an added benefit, i overlooked the numerous sushi chefs as they commenced the daily ritual of preparing the recently arrived fish. One meticulous carved a tuna to extract its magnificent center portion while others prepared mackerel and salmon. It was both a delicious meal and a bit of an education. The only drawback was an aggressive server who though he deserved an $8 dollar tip on a $12 bill. I handed him a twenty and he asked if I wanted change. Just be on the lookout for this bad behavior. Overall I really liked Kazu and it is a quick, varied lunch that can include Asian cuisine from sushi to katsu. Some colleagues in my office recommended Li’s Brothers, so I decided to give it a try. With a friend on his way to join me for a quick lunch in the office before a meeting, I ordered fried dumplings, General Tsao Chicken and Moo Shu Chicken. None were available under their Lunch Special menu, so each of these were full sized portions. First, the portions are very large, you can easily share a single order. Dumplings – there are six dumplings to an order. They were lightly crisped on one side. These were not very good. They were under-cooked, very doughy and had very little filling. It was similar to biting into raw dough. Moo Shu Chicken – A large portion with several pancakes. I decided to first try the chicken without the pancake. One bite was enough to convince me that the Moo SHu Chicken was not to my liking either. There was an incredibly bitter flavor in the chicken, and the overall dish was not very good. General Tsao Chicken – I did not have high hopes for this dish after tasting the other two. The dish was also a large portion, served atop a large mound of broccoli. It was primarily fried crust covered with an over-sweet sauce. The scant amount of chicken was intermingled with pieces of chicken bones and cartilage. This was the worst of the three dishes. I was really hoping I would like Li’s, but I would be hard pressed to return. I’ve been pretty lucky with two visits to Olio Restaurant in Stamford over the last few weeks; each delivered some outstanding cuisine. The first was a quick stop for a burger to complete my update of the best burgers in Fairfield County and the second was a dinner visit a week later. Co-Owner Moira Hyland met our party of four at the door, showed us the table and was the perfect hostess throughout the evening. The server approached and asked for water, soda or wine and explained the specials for the evening. Two of them sounded delicious and I ordered both. The appetizer was a baby greens and beet salad and the entrée was a pork chop with pickled ramps and succotash. Others at the table ordered a variety of salads and they all chose the gnocchi with Bolognese for their entrées. We let Chef / co-owner Steve Costanzo work his magic in the kitchen. The salads arrived and they were all very generous in size. My salad included an array of locally grown baby greens tossed with walnut pieces, roasted beets, all dressed with a honey thyme mustard vinaigrette. The salad was perfectly dressed and focused on the wonderful, natural flavors of the greens. The beets were sweet and the walnuts added both an earthiness and a textural contrast with its crunchiness. I highly recommend this salad and the others at the table were as enthusiastic about their choices. The entrées arrived and mine was a large single 10-ounce French cut pork chop nestled in a house-made succotash of fresh peas, corn, zucchini, red peppers with roasted plum tomatoes a little white wine, chicken stock and butter. The chop was topped with pickled ramps (they were pickled earlier in the day). The chop was perfectly cooked, moist on the interior with a great spice-rub finish. The sweetness of the fresh vegetables were a great complement to the pork and then the ramps kicked in to deliver tremendous flavor to the overall composition of the dish. The Ricotta Gnocchi with Bolognese was a very generous portion. The gnocchi were delicious, with great texture and the Bolognese was one of the best I have tasted since my Bolognese search last year. It delivered rich flavors, a great balance of sauce to meat and was a delightful complement to the mild gnocchi. As dessert approached, I highly recommended the donuts to the table and we also ordered a molten chocolate cake. The donuts were as I remembered, absolutely delicious and the molten chocolate cake, served with vanilla ice cream, whipped cream and few berries. This was also an excellent dessert, a chocolate-y delight. Olio remains one of the best hidden gems, and I might need to remove “hidden” as every table was taken and everyone had a smile on their faces and a huge thank you to Moira as they left. City Limits Diner in Stamford is a member of the Livanos Restaurant Group that includes one of my favorite NYC restaurants, Molyvos. I was first introduced to high-end Greek food at this restaurant and when City Limits arrived in Stamford, I heard that the food was excellent and the bakery was one of the best. Looking at the menu there are numerous selections normally found at a diner. Breakfasts include eggs & omelets, pancakes, waffles, house-made granola and a few items that I would love to try including a chorizo and egg quesadilla and a crab cake benedict. Order an item from the bakery and have a great breakfast. When lunch and dinner hits there are a couple of items that grab my attention including Kobe Beef Hot Dog on a pretzel roll with Jalapeño jack cheese, pickles and Chimichurri, a Turkey Cobb salad, and, from some e-mails I have received, a pretty good burger. A very eclectic group of entrées include a chicken loaf, fish & chips, crab cakes and ravioli. Coming from NJ I miss seeing the open faced roast beef or turkey sandwich, but I could probably get used to the change. They are currently introducing a few weekly special evenings and my buddies over at www.ctbites.com post them every week on the “Weekly Nibble.” Take a look over there and check it out.